Is the wash & go your staple style? 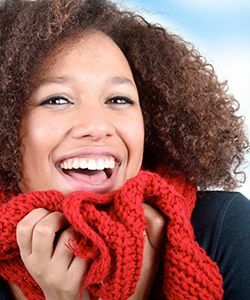 Some people use the winter months to wear protective styles, shielding their curls and coils from harsh weather. We know that’s not a desirable route for everybody, and the wash and go will continue year-round. But how can you avoid leaving the warmth of your home to fare frozen temperatures with wet hair? We’ve done the work for you and found a couple popular ways people still enjoy wash and gos without catching a cold in the process. If you already have a preference for night showers, these next three methods will be easy to get used to. First, try doing your wash and gos in the evening, giving your hair time to air dry in the comfort of your warm home. Experiment with the pineapple method and gather all your hair (or sections of it) into a high puff(s) or ponytail(s). Just wrap the hair tie once or twice around. This will keep the roots stretched as they dry, but the length of your hair will stay defined through the night. In the morning, just take out the hair ties, shake/fluff, and go! If the pineapple method just isn’t for you – either your hair is too short, or the pineapples stretch your hair too much – skip them altogether. Cowash and style your wash and go in the evening and let it air dry as you cook dinner and catch up on that episode of "Scandal." In the morning, your coils will probably be smooshed and compact. Spray your hair with a bit of water and shake or fluff to achieve the desired shape. Finish getting ready for the day, and your hair should be dry before you walk out of the door! If you hair air dries quickly, you can add three or four light spritzes of water to your wash and go and cover with a shower cap before bed. Be sure to mist a small amount of water. Overnight, the light moisture will be trapped, keeping your coils moist, but not wet. Remove the shower cap, fluff, and go! Naptural85 on YouTube made a video showing how she maintains her wash and go using this method. We saw this method on Naptural85’s YouTube channel. It needs no product, and admittedly, looks like a twist out. If you do the twists large and loose enough on wet hair, when you unravel them in the morning, they might still be slightly damp enough to be a fuller, more defined version of your traditional wash and go. Buy a diffuser attachment for your blow dryer and get to diffusin’! The purpose of this attachment is to spread the air over a larger area. It won’t focus so much heat on a section of hair, providing a much more immediate wash and go without using too much heat. Tilt your head to the side, gather a section of hair on top of the diffuser attachment and let the air gently dry your hair and scalp. Keep alternating sections to ensure an even process. Watch IAmNaturallyCurious’ video for a visual. If you don’t mind wet hair in the colder months, or it’s sunny year round, we’re jealous! Pass this on to a friend who needs it.